They say that some of the greatest advances of science (penicillin, the theory of gravity, etc.) were discovered because someone saw some poundcake in a tupperware container. That saying has never been right--until today. Yesterday I had some poundcake. I ate half of it and left the other half on the table to become stale. That's what I do. However, when I awoke, I discovered that someone had put the poundcake in tupperware. And the poundcake was still fresh! Shocking? No. We all know that's how tupperware works. But the question is, how does it work? What makes something stale? I think it's contact with the air. There must be minute particles (which I call "staleness molecules") suspended in the air which causes poundcake to become hard and unappetizing. So far I feel that I'm on stable scientific ground... but what confuses me is that in the tupperware container, there is clearly air surrounding the poundcake! Like, the half of a poundcake didn't fill the tupperware container at all! And yet it did not grow stale! I sense that there are forces beyond human comprehension at work... and an inner voice warns me not to pursue this secret of nature any farther. "That way lies dragons," it whispers, "and madness..."
But in a way, it is too late for me to turn back. It was too late from the moment I saw the poundcake in the tupperware container. The mystery must be solved. 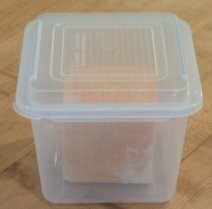 Somehow, a piece of poundcake in tupperware will stay fresh, even though it is in contact with air. It must somehow change the nature of the air. What must be happening is that the "staleness molecules" in the tupperware container, when they come in contact with the poundcake, are being neutralized, or converted into "freshness molecules". The implication of this discovery is this: the air currently surrounding my poundcake in its tupperware container is a very special kind of air. Absolutely "staleness-neutral", it can be used and reused to package food without ever imparting a bit of decay. Imagine a whole house filled with this staleness-molecule-free air. Refrigerators would not be needed. The house's ageless inhabitants would be able to walk through a utopian wonderland where always-crispy celery lay strewn on the floors, and cookies and milk unconsumed by Santa would still be good next year. Extend this discovery further. Imagine a world where all the air was fresh and pollution and starvation were no more. It's within our reach. 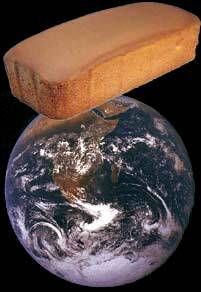 All we need is a big enough pound cake, kept somehow floating over the lands of the earth, to banish these problems forever. But it would have to be a pretty big pound cake. Given that the half of the poundcake that sparked this discovery was probably big enough to account for 1/4 of the volume of the tupperware container, we can easily establish an upper limit for the necessary size of the orbiting uber-pound cake. Now we just cross-multiply and solve for x. That gives us the mass of the needed poundcake, which is approximately 6.5 x 1017 kg. Since poundcakes notoriously weigh a pound, we must multiply by, I think, 2.2, so the equivalent of 1.43 x 1018 poundcakes are needed. How tall would this poundcake be? I'm guessing that an average poundcake is about six inches tall and wide and maybe 8 inches long. A poundcake of the same proportions but weighing 1.43 x 1018 pounds would be 740,000 feet tall and wide and 1,000,000 feet long, or merely 150 miles by 150 miles by 200 miles. (Before launched, it would cover an area six times the size of Rhode Island, but, of course, it would be much taller.) It would be child's play for NASA to create and launch a confection of that magnitude. If you, like me, want to live in a better tomorrow, I urge you to email your local congressman, parliamentary member or other representative. The subject of the email should be PLEASE MAKE A FLYING POUNDCAKE SIX TIMES THE SIZE OF RHODE ISLAND TO ELIMINATE POLLUTION AND DEATH. Thank you for your time.